By letting your holiday homes out to visitors for exciting travels and unique adventures, you play a significant role in providing customers with the ultimate holiday experience. After all, finding an affordable, accommodating and safe environment to call ‘home’ during travel can make or break the trip as a whole. 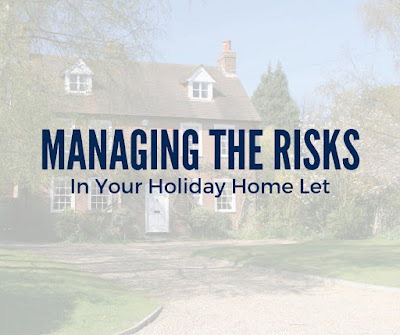 Although being the source of travellers’ joy and excitement can make for a rewarding career, letting your holiday homes out to others can also carry a variety of risks. Whether it’s maintaining your homes’ electrical appliances and furnishings or avoiding unexpected disasters, such as a fire, it is crucial to be aware of the risks present in your homes and take action to either mitigate or eliminate them. Not to mention, specific health and safety regulations require you to provide certain accommodations for guests. Ensure that your visitors have a wonderful holiday experience and that you avoid potential risks by using the following guidance and cover suggestions. Use this guidance to keep your guests and your property safe, as well as ensure you are compliant with all applicable rules and regulations. If your homes possess any gas installations, such as a gas oven or stove, you must arrange an annual gas safety check and provide to guests a certificate or record at the beginning of the letting period or within 28 days of your yearly gas safety check.If the property is let for fewer than 28 days at a time, you may simply display a copy of the current gas safety record. Keep in mind that a gas safe registered engineer must complete all gas maintenance and services. Maintain past documentation of your gas installations and gas safety inspections dating back a minimum of two years. Provide detailed instructions on gas shut-off valves and emergency contact information in the event of a gas leak or explosion. Carry out electric installation assessments every five years. In addition, conduct portable appliance testing on all electrical appliances you provide, such as a lamp or toaster. Complete routine visual inspections of your electric installations, fixtures and appliances. Be sure all light bulbs, light switches, and appliance cables or plug-ins are in working order. When hiring a maintenance employee or contractor to carry out electrical or gas work on your property, make sure they are competent, qualified and legally permitted to do so. You are required to install a smoke alarm on each storey of your holiday home. In any rooms that have a solid fuel appliance (e.g. a wood burning stove), you are required to install a carbon monoxide alarm in each of those rooms. In addition, you must complete an assessment of these appliances on the first day of each letting period to ensure they are working properly. If you let your holiday home for more than four months out of every year, you must provide an energy performance certificate (EPC). An EPC summarises the energy efficiency of your property. You must have a minimum EPC rating of 'E' to continue letting your holiday home. Engage in routine checks to ensure the water supply is working properly prior to the beginning of each letting period. Be sure that showerheads, sinks, and bathtubs are free of rust, sediment and mould. Ensure that basins, shower trays and toilets do not possess any cracks to avoid water leakage. Consider non-slip floor mats in toilets with a shower or bathtub to avoid slips and trips. You are required to perform a risk assessment in your holiday home for exposure to legionella. You can find additional HSE guidance here. Maintain all furniture and furnishing labels, especially those that contain warnings. For example, it is important to leave a label on a piece of furniture that warns it might be flammable. All upholstered furniture, beds, headboards, mattresses, cushions and pillows are required to comply with the Furniture and Furnishings (Fire)(Safety) Regulations 1988. Routinely inspect furniture for broken parts, usability and cleanliness. Make updates and replacements as needed. Try to implement wood or solid material furniture with smooth edges as much as possible to avoid guest injuries. Furniture with sharp corners or glass can cause bumps, bruises and falls. Consider covering untreated fabrics with fire-inhibiting sprays if they are not fireproof. Ensure all glass is fitted securely in your holiday home windows and balcony doorframes. Offer guidance for guests on opening and closing windows. Be sure all windows are securely locked when the holiday home is not in use. Regularly check to make sure any balcony railing is stable, reinforced and above waist level to decrease the risk of guests falling from height. Try to avoid using window blinds that have hanging, looped cords, as this can become a strangulation hazard. Be sure that balconies have door handles both inside and outside, as well as a locking device. (Fire Safety) Order 2005 in England and Wales, and the Fire Safety Regulations 2006 in Scotland. You are required to carry out a fire risk assessment. This assessment will help you identify and remove or reduce fire hazards. Try to update the assessment every year. Ensure all smoke alarms are in working order by testing them before each letting period. If your home has a chimney, schedule regular cleanings to reduce any build-up. Be sure all points of entry and exit are easy to open and lack obstructions in the event of a fire. Inform guests of your home’s emergency evacuation plan in the event of a fire and offer emergency contact numbers. If your home contains a log burner or open fire, provide a suitable fireguard. Keep all heat sources far away from flammable materials. In addition, offer equipment for putting out small fires. Consider providing automatic outdoor lighting to ensure entrances and exits are illuminated. Maintain all paths, patio space and walkways to avoid potential slips and trips. This includes clearing the areas of litter, ice and snow. Be sure all garden furniture and devices are in good working condition and structurally sound. Carry out a risk assessment for guests and maintenance employees that work by the pool. Install a fence around the pool with a self-locking gate. Store all pool cleaners and chemicals in a securely locked area as well. Display signs throughout the pool area that state the water depth and that guests should not dive or run. Offer pool safety equipment, including a hook, life-saving devices and a ladder to enter the pool. Consider a non-slip surface for your pool deck. Keep proper documentation of pool maintenance. Be sure you are compliant with all health and safety regulations. When letting multiple holiday homes, it is common to use a letting agency or letting service. If you decide to do so, be sure to determine whether a letting agent or online service is best for you. Letting agents can offer in-person guidance and provide legal and tax advice, but are more expensive. Online letting services allow you to advertise your homes with the click of a button, have minimal fees and can help you vet potential guests. However, you run the risk of receiving negative online reviews. Regardless of which form you choose, make sure that the letting agent or online service is qualified and trusted before reaching an agreement. Establish a written tenancy agreement to avoid future legal disputes. You are required to check that your guests have a right to rent (must be 18 years or older). You must provide your guests with the EPC and gas safety certificate. Consider creating a packet for guests with all vital information in one place. .
You are required to comply with all applicable laws in the Health and Safety at Work etc. Act 1974. Holiday home/let insurance offers cover to protect both your holiday home against potential damages (e.g. a fire or flood) and its contents. Public liability cover applies if your home causes injury or illness to a third party (such as a guest). Employers’ liability cover offers protection if a maintenance employee (such as a cleaner) makes a claim due to illness or injury caused by working on your property. Alternative accommodation cover offers protection if your home becomes uninhabitable by an insured disaster and it’s your responsibility to find alternative housing for your guests. Loss of rent cover protects against the risk of a disaster or crisis causing guests to move elsewhere and leaving you empty-handed for the payment. 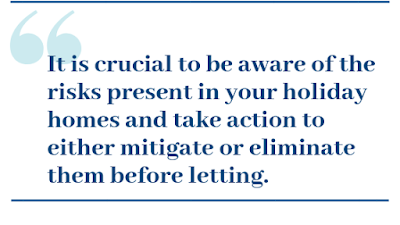 For additional guidance on protecting your holiday home let, contact ICB Group today.